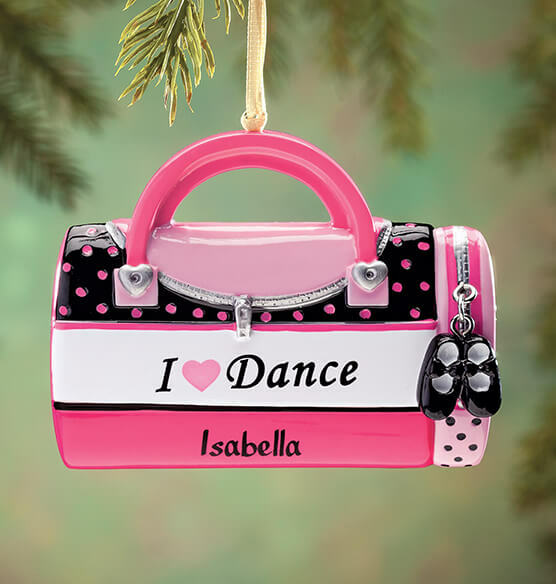 Give your favorite dancer a starring role on the Christmas tree with our Personalized "I Love Dance" Ornament. Adorably crafted like a dancer's shoe bag, this custom ornament is detailed with pink polka dots and tiny silver hearts. Personalize with the name of one talented dancer, creating a keepsake treasure. Specify name. A little pair of dance shoes dangle from the painted silver "zipper"
Artfully printed with "I 'HEART' Dance"